TALLAHASSEE -- Sen. Tom Lee, one of the Senate’s most powerful Republicans, took the stand Friday in the ongoing trial over how to configure Florida’s 27 congressional districts and said that he did not draw a district to benefit himself and he had no intention of running for Congress. 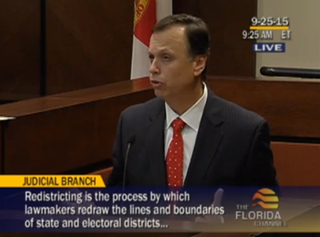 It was a rare, personal moment in the unprecedented process that has reshaped how redistricting works in Florida. But, while the testimony was designed by the Senate to undercut attacks by the Republican-led House that the Senate map was drawn to benefit incumbent Republicans, it also exposed how the congressional trial is really just a practice run. Leaders in the House and Senate have concluded that the outcome of the trial will have a direct impact on the drawing of something more personal than congressional districts — the Senate map — because how the case is resolved could decide how much input legislators will have in shaping that plan. Sen. Tom Lee, R-Brandon, testifying during a hearing Friday on the congressional redistricting map.